A method of phonetic printing; especially, that which was devised by Isaac Pitman (1813-1897) for printing English words. A representative type of a plant. A reference to the process whereby a single stimulus can elicit multiple unrelated responses from a living cell. Representing, or constituting, an original type of the first units manufactured of a product that is tested so the design can be changed if necessary before the item is commercially manufactured: "The auto company presented its latest prototypal model of a new electric car." 1. 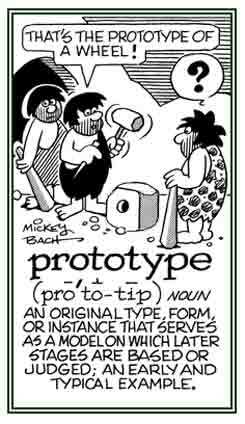 The original form of something, which has the essential features and is the model for subsequent forms: Ralph is developing a prototype for his new computer application. 2. A first full-size functional model to be manufactured; such as, a car or a machine: The newspaper has an article stating that a prototype of the newest solar-powered car will be on display next week. 3. A standard example of a particular kind, class, or group of something: Anita is one of the prototypes of successful business people. 4. In biology, a primitive form believed to be the original type of a species or group, exhibiting the essential features of the later type: The ancient drawings on the wall of the cave suggest prototypes of the animals that currently exist in the area. © ALL rights are reserved. Biology: a primitive or ancestral form of an organism. Engineering: a full-scale model of a structure or piece of equipment, used in evaluating form, design, fit, and performance. Psychology: the characteristic model or example on which a concept is based. 1. Referring to actual, or potential, borderline schizophrenia; a condition characterized by cold aloof feelings, eccentric behavior, hallucinations, illusions, and delusions. 2. Characterized by, exhibiting, or being patterns of thought, perception, communication, and behavior suggestive of schizophrenia but not of sufficient severity to warrant a diagnosis that it is schizophrenia. A personality disorder characterized by eccentric thought, speech, and behavior and social withdrawal; similar to but not as severe as schizophrenia. A schizophrenic type or a group of psychotic disorders, often beginning after adolescence or in young adulthood, characterized by fundamental alterations in concept formations, with misinterpretation of reality, and associated affective, behavioral and intellectual disturbances in varying degrees and mixtures. A schizoid personality type in which an individual is prone to seclusiveness, emotional rigidity, introversion, and unsocial behavior. A personality type who is characterized by unusual patterns of speech and behavior and by social withdrawal. 1. A group of organisms, microorganisms, or cells distinguished by their shared specific antigens as determined by serologic testing. 2. The set of antigens that characterizes the group. Soils that include clay, sand, earth, dirt, loam, etc. The body structure or build of a person; especially, to the extent to which it exhibits the characteristics of an ectomorph, an endomorph, or a mesomorph; as explained in body type. 1. A keyboard machine used to record dictation in shorthand by a series of phonetic symbols. 2. A keyboard machine resembling a typewriter, used in a system of phonetic shorthand. 3. A phonetic symbol or combination of symbols produced by such a machine. Showing page 4 out of 7 pages of 97 main-word entries or main-word-entry groups.